Kirkwood was always guided by an optimistic outlook on life. It's called 'one day at a time'. Reminds me of the original movie MASH. Trapper says to Hawkeye, "Don't you have any olives...You can't saver your martini without an olive"..
Hawkeye, "Well we are 3 miles from the front and we have to make some concess....". "Plop" goes the olive in the glass. I will work for olives so I could add it to my Persian Lime Martin(i)! I have added your cartoon to my latest post. But will he declare the olive on his taxes? After all, his expertise may be sought by the new Administration... sooner or later. So there he is. He blew the biggest part of his entire bailout "allowance" on a shipping container full of Revelation & who-knows-how-many-cases of Noilly Pratt. The rest went to John McCain's wife's glacial ice distributorship (the latest evil Republican plot to destroy the polar ice caps, bring the oceans to a boil, & wipe out life on earth as we know it). 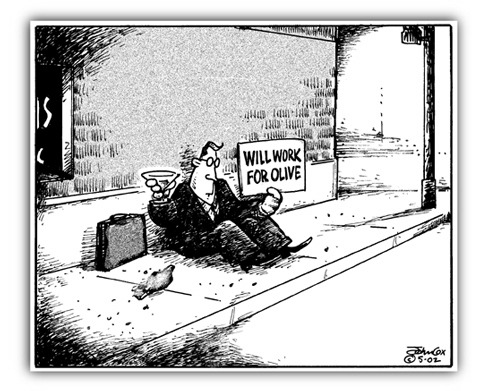 Somewhere around $78 billion up in smoke, & he has the nerve to ask for an olive. Just tell'em you're a Democrat, buddy. They'll fire up the fiat presses & look the other way. This page contains a single entry from the blog posted on February 4, 2009 5:05 PM. The previous post in this blog was TERRA MECHANICA I, II.